Radianse delivers reliable and precise real-time data management, providing a high degree of visibility throughout your business environment. Our patented algorithms continuously analyze data from many sources, while the web-based software displays this data in real-time. The Radianse System uses a variety of technologies to provide the live communication of context data sources with analyzing software. Utilizing a wide array of available technologies provides the accuracy required to better meet your specific business needs. The ID-Tags and other data sources are designed to be easily and quickly installed and configured: plug & play! Radianse Receivers connect to existing Wi-Fi networks or standard Ethernet LANs. The system uses minimal bandwidth and requires no complex site survey or need to constantly calibrate, as well as has built-in self-diagnostics. Radianse will install all equipment as well as certify that the system meets required specifications. Our engineers will assist in setting up the necessary tools to keep your Radianse System running smoothly. Our goal is to make your real-time system virtually maintenance-free. The Radianse System can scale out with the addition of memory and process cores in both a physical and virtual deployment. Based on the application need, you can choose a mix of zone and room level precision. Once the platform is in place, software updates can be done remotely and new applications can easily be added. 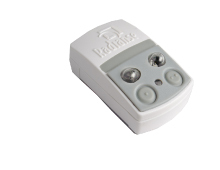 Radianse offers a variety of ID-Tags and Receivers to fit any business’s need. We provide tracking equipment that can be worn on lanyards, in thin bracelets, are durable for heavy equipment, placed in doorways, even monitor temperature. What ever your specific need is, Radianse has the hardware for it. We also work with hardware from approved third party vendors. Radianse has a line of ID-Tags that are designed to withstand harsher environments, resist water penetration, and be reused. The ID-Tags can be cleaned and reprocessed so that they are free of contamination and safe to reuse. Point-and-click configuration of the Radianse software applications lets you define alerts based on any combination of tagged personnel or assets. These “alerts” generate notifications that can be sent on screen via text, email, or to another company software application. Radianse has a host of specialized software applications that help drive operational efficiency. Once the hardware is implemented in your environment, the data collected will help improve business processes as well as bring enhanced visibility of assets, flow patterns, personnel interactions, and more. Above all else, the Radianse System is extremely customizable. Our innovative technology allows you to create solutions for your specific company needs. The Radianse Awareness Suite enables you to see any status information required as well as set staff schedules, view past ID-Tag interactions, and more. Being able to build a solution specifically for your business gives you the power to enhance processes, save time, and save money.